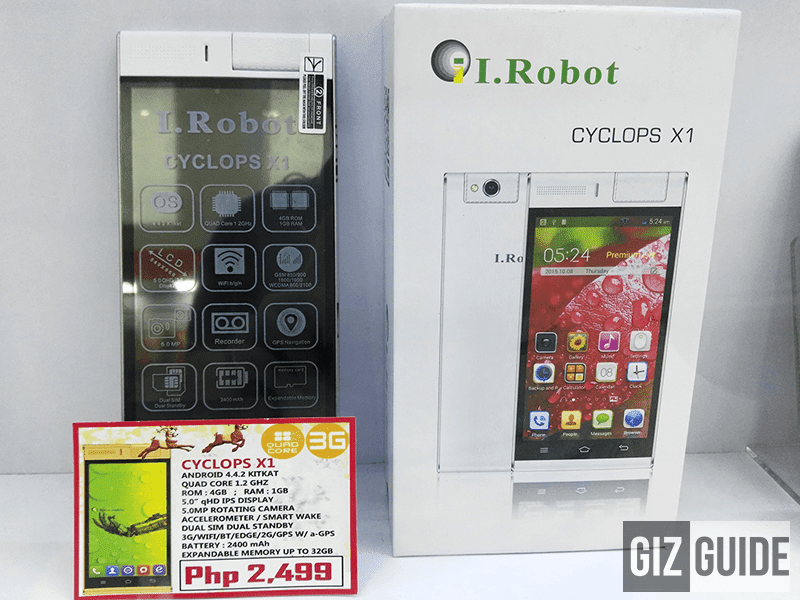 I.Robot Cyclops X1 Has 5 Inch Screen, Quad Core Processor, 1 GB RAM And 5 MP Rotating Camera Under 2.5K Pesos! Home / i.robot / mobile / news / I.Robot Cyclops X1 Has 5 Inch Screen, Quad Core Processor, 1 GB RAM And 5 MP Rotating Camera Under 2.5K Pesos! Aside from the Cyclops X2, we also spotted a smaller I.Robot handset at SM Light Mall with one of the nicest internals in the sub 2.5K Pesos range. Dubbed as the I.Robot Cyclops X1, it is a 5 inch handset with quad core processor, 1 GB of RAM and 5 MP rotating camera. So far the only downside I can see in its specs for the price is the use of the older Android 4.4 Kitkat instead of the usual Lollipop. However, who am I to complain on a phone with an SRP of just 2,499 Pesos.